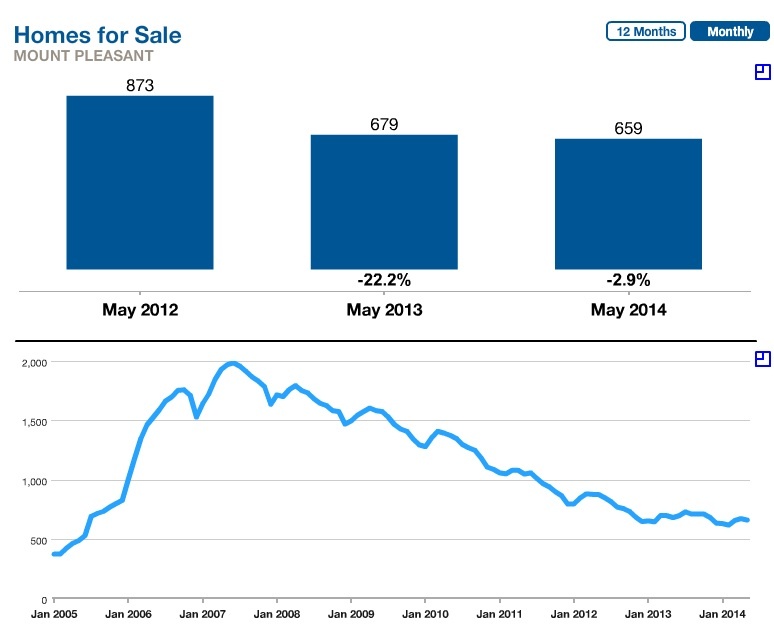 Mount Pleasant is still leading the real estate trends in the Charleston SC Metro Area. Inventory in Mt Pleasant continues to be low and demand still strong, with many homes (especially those under $400,000) going under contract in less than a week. 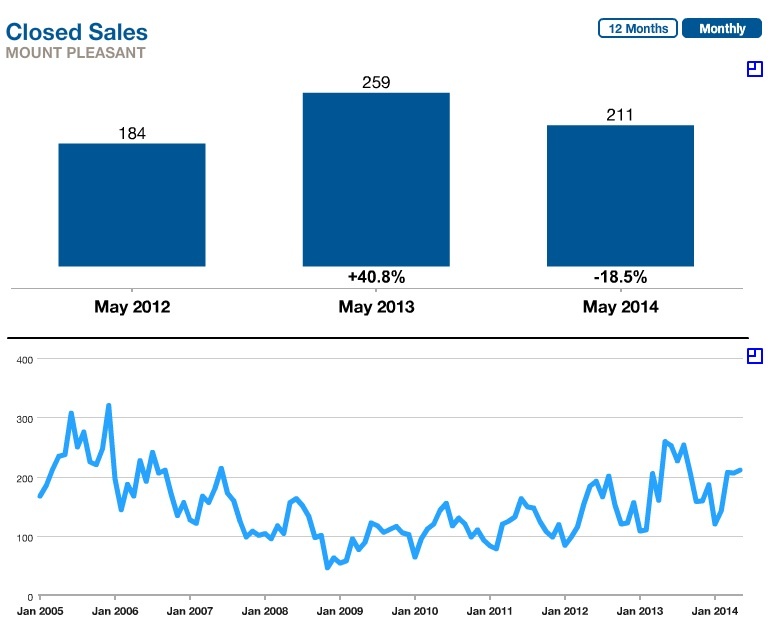 The seasonal fluctuation in inventory has "flattened out" in Mt Pleasant, with the number of homes (including single family detached homes, condos and townhomes) for sale via the MLS "leveling out" between 650 and 700 homes, a number of homes similar to the number that were available in mid-2005, before the "crisis" started. May 2014 saw a spike in inventory above the 900-home mark, as many existing homeowners saw the opportunity to sell and maximize their equity (or avoid a loss/short sale) and placed their homes on the market after waiting for several years. (Are you curious about the current market value of your home? Try our free, online value estimator). The absorption rate (or Months of Inventory - the number which measure the relationship between supply and demand of homes) is still dropping, which means that the demand for homes in Mount Pleasant is still strong and outpacing supply of new construction homes. Popular neighborhoods like Belle Hall are experiencing absorption rates between 2 and 3.5 months', which signals a clear "sellers' market" with rising home prices. Closed sales are hovering around the 200 homes per month, about four times the number of homes that were sold each month back in 2009, although in May the market experienced an 18% decrease in sales from the number of sales recorded in May 2013. 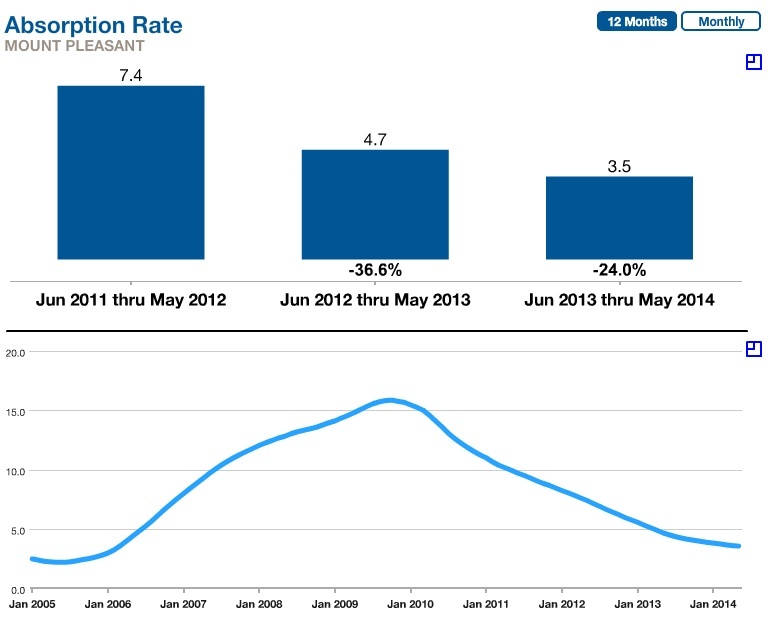 As of June 6, there were 580 homes "Under Contract" or "Pending". Of these, 327 were "Pre-owned", which means that almost half of all the pending homes in Mount Pleasant are new construction. New home builders are extremely busy these days, with the major players being Carolina Park and Oyster Point. Days on Market and Average Sold/List Price Ratio, two indicators that show the strength of the market, continue to improve (from a seller's perspective). 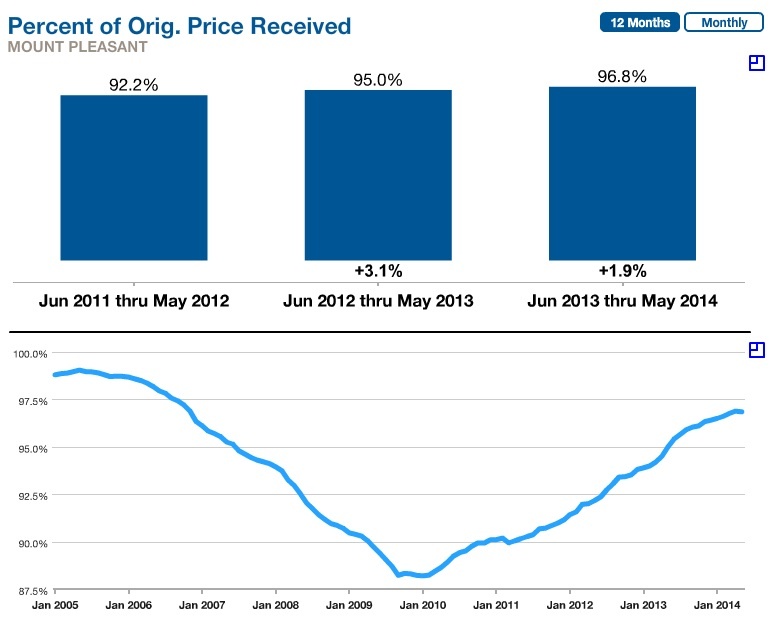 The average home in Mount Pleasant is now selling at around 97% of list price, and lasting on the market about two months. However, in our opinion, these indicators are much stronger in the $250K-$400K price point for single family detached homes, where well maintained and priced homes tend to go under contract in a matter of days. If you would like to learn more about how these market trends will affect the value of your home, please call 843-900-0155 to request a free estimate of market value.